You name it, we can do it! Make your project stand out. From bulk on spindle to retail ready packaging, we provide a full range of packaging and printing solutions. There are many standard options available, but we can also help conceive and design unique custom pieces just for you. In need of Kickin' Design for your CD, DVD or Blu-ray discs? Need a complete set of documents to match such as jackets, report folders, album covers and more? DiscBurn has a full-service, artistic rock stars to handle any design and printing requirements for your project. Here are several standard packaging options. However don't limit yourself to these. 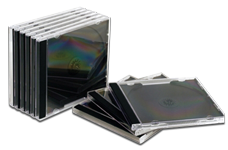 We can provide any media packaging you desire. We utilize hybrid printing technologies to make sure that the colors of your DVD or CD printing and your printed inserts and wraps line up. Our in house graphic designers are ready to make sure that you have the right templates to make sure everything lines up perfectly. If you need a custom die cut mailer to support your marketing directive – don’t sweat it. At DiscBurn it’s all good. We’ve spent years sourcing the perfect packaging. 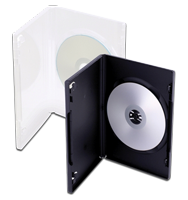 Disc packaging with just the right amount of plastic, ensuring your discs arrive safe and secure. No worries – that’s another one of our mottos around here. We’re not going to let your duplication project showcase a lackluster ill conceived marketing piece. Packaging can make or break any product and with a disc publishing job – it’s no different. Packaging and design affect day to day decisions all the time. How many of us are guilty of choosing a particular wine because the label looked cool? With a CD or DVD duplication project it’s no different. Patricia, the head of marketing for a tractor manufacturer, has spent millions of dollars building her brand. That’s why when she calls us, we make sure that her owner’s manual has just as much thought put into it as the design for her new tractor lineup. We’re in the business of making you look good, so give us a call and give me the silent treatment. It's okay, I’ve heard it before and I've got you covered.